E Anyanwu. The validity of the environmental neurotoxic effects of toxigenic molds and mycotoxins. The Internet Journal of Toxicology. 2007 Volume 5 Number 2. The problems and controversies about the validity of environmental neurotoxic health effects of toxigenic mold and mycotoxin exposures have taken a center stage in scientific, legal, social, and political discourse to which important basic scientific truth has been misrepresented by subjective “double talk” in recent years. Fortunately, the scientific truth is characterized by objectivity and systematic organization based on compelling pieces of evidence. This paper reviews the relevant, most recent peer reviewed literatures that support the validity of the environmental risks and adverse neurotoxic health effects of chronic exposures to toxigenic molds and mycotoxins. The structures of typical mycotoxins are cited to show the relevance of functional groups, and how their biochemical activities may contribute to adverse health effects in relation to signs, symptoms, and mechanisms. The proven interactions between the biological system and the molecular functional groups of mycotoxins are evaluated to explain how they may lead to neurotoxic health effects in terms of carcinogenic, biochemical, immunological, neurophysiological and behavioral properties. Based on all the relevant affect factors, there are huge compelling pieces of evidence derived by exposure conditions, clinical presentations, scientific laboratory investigations, and the development of science of nanotoxicology, that support the validity of adverse environmental neurotoxic health effects of toxigenic mold and mycotoxins. Adverse health effects of toxigenic molds and mycotoxins have been recognized for centuries following environmental exposures and ingestion of contaminated foods. It is no longer arguable that normal building materials and furnishings are susceptible to, and provide ample sources of nutrition for many species of molds. It is accepted that under favorable conditions, toxigenic molds can grow luxuriantly, and amplify indoors especially, when there is an adequate supply of moisture. Occupationally, toxigenic mold infections have been reported are known to cause diseases in industrial or agricultural settings after inhalation exposure to toxigenic molds . Globally, disproportionate growths of toxigenic molds are serious public environmental health problems that are misunderstood mostly, because of the complexity in their natural mode of life and duality of functions. Under favorable conditions, toxigenic molds can develop rapidly, to produce metabolites to which are either broad-spectrum antibiotics, or mycotoxins that are cytotoxic to human health . Mycotoxins are highly stable compounds, and the toxigenic molds producing them are ubiquitous in the environment . These two properties of toxigenic molds account for their survival and persistence in the environment. The most common routes of exposure to toxigenic molds and mycotoxins are by spores ingestion of contaminated foods, dermal, respiratory, and parenteral routes, the last being associated with drug abuse . The most frequent toxigenic molds in Europe are Aspergillus, Penicillium, and Fusarium species . They produce aflatoxin B1 transformed into aflatoxin M1 found in the milk, as well as Ochratoxins and Zearalenone, Fumonisin B1, T-2 toxin, HT-2 toxin, and deoxynivalenol (vomitoxin), which are of increasing concern in human health everywhere in the world. In the USA, the predominant toxigenic molds that have been identified and vastly documented are the Alternaria, Cladosporium, Aspergillus, Penicillium, Stachybotrys, Curvularia, Basidiomycetes, Myxomycetes, smuts, Epicoccus, Fusarium, Bipolaris, and Rhizopus [6,7,8]. Hence, these molds and their mycotoxins are under continuous survey in Europe, albeit, with unstandardized effective regulatory apparatus at European level . Based on available evidence however, it is accepted in Europe and elsewhere, that the mycotoxins produced by these toxigenic molds are particularly a risk for human health [2,9,10]. The structural and functional properties of mycotoxins and their intracellular activities and mechanisms are the fundamental basis for their pathophysiological, and neurodevelopmental mycotoxic effects . A partial list of known mycotoxins is shown in Table 1. What makes most of these mycotoxins toxicologically unique is their possession of similar chemical architecture, varying molecular weights, and identical reactive functional groups. Table 1: A Partial List of Known Mycotoxins (N. Carolina Coop. Extension). 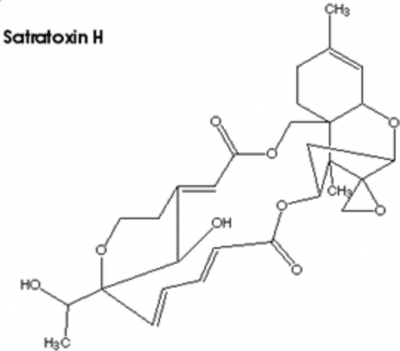 Aflatoxin M1 and satratoxin H mycotoxins, for example, are shown in Figures 1 and 2. 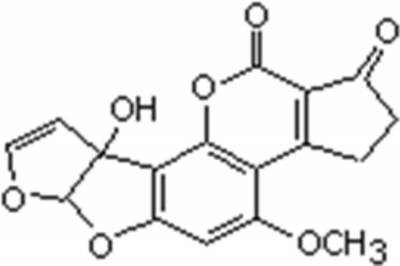 Aflatoxin M1 with a molecular formula C17H12O7, and a relative molecular mass of 328 Da, is the 4-hydroxy derivative of aflatoxin B1 (Fig. 1), and is secreted in the milk of exposed mammals. Satratoxin H produced by Stachybytris is extremely toxic and abortogenic properties in animals, and in high doses, or chronic low doses, it can be lethal. No safe dose level of mycotoxin in humans has been effectively determined as to establish the suggestion put forward by Hardin et al.. Figure 1: The chemical structure of aflatoxin M (Relative molecular mass of 328 Da and has the molecular formula CHO). Hence, the safety regulations in place now remain inconclusive, precautionary, and arbitrary. Since some of the antifungal drugs are derived from molds, and since they have structural and functional groups similar to those of mycotoxins, the knowledge of their interactions are important in enhancing preventive measures . Production of mycotoxins is dependent upon the type of producing fungus and environmental conditions, such as the substrate, water activity (moisture and relative humidity), and duration of exposure to stressful conditions, and microbial ecological interactions. The toxicity of the mycotoxins varies considerably with the toxin, the animal species exposed to them, and the extent of exposure, age, and nutritional status. Several Aspergillus species are associated with mycotoxin production: A. ochraceus with ochratoxin A, A. fumigatus with fumitremorgins, gliotoxin, and verrucologen; A. versicolor with sterigmatocystin, and A. flavus and A. parasiticus with aflatoxins. Sterigmatocystin may also be produced by A. flavus, A. nidulans, A. rugulosus, and A. unguis . Penicillium on the other hand, produces sterigmatocystin, fumagillin, verruculogen, penitrem A, and roquefortine C, which cause serious toxic effects. Sterigmatocystin is known to cause a 80-fold higher toxicity in lung cells indicating supporting involvement in the etiology of lung diseases due to the inhalation of organic dust . In addition, exposure to mycotoxin may occur via enteric, inhalation, or direct contact to skin and mucosa. Acute and chronic disorders, irritation, systemic reactions, and even cancer may develop after the exposure to these toxins. Some mycotoxins have the propensity to act as immunosuppressants, which may be in association with an increased prevalence of repeated infections found among the exposed inhabitants of buildings with flooding and moisture problems. Symptoms include respiratory complaints that involve the nose and lungs; eye symptoms, and mucous membrane irritation. Actively growing fungal colonies can release volatile substances that have an unpleasant smell, leading to psychological responses in the occupants such as fatigue and nausea. For almost all allergic individuals, the reactions may be limited to rhinitis or asthma, and sinusitis may occur secondarily due to obstruction . The major presentations are headache, general debilitating pains, nose bleeding, fevers with body temperatures up to 40 degrees C (104 degrees F), cough, memory loss, depression, mood swings, sleep disturbances, anxiety, chronic fatigue, vertigo/dizziness, and in some cases, seizures . Although sleep is commonly considered a restorative process that is important for the proper functioning of the immune system, it could be disturbed by mycotoxins. A study by Rea et al. , found that respiratory signs (e.g., rhinorrhea, sinus tenderness, and wheezing) in 64% of all patients. Physical signs and symptoms of neurological dysfunction (e.g., inability to stand on the toes or to walk a straight line with eyes closed, as well as short-term memory loss) were also identified in 70% of all patients . Pediatric exposure to molds may constitute a health threat to children resulting in respiratory symptoms in both the upper and lower airways, increased incidence of infections, and skin manifestations. At chronic exposure levels, nose bleeding, hemoptysis, and pulmonary hemorrhage may occur . These adverse health effects can occur through various mechanisms, including immunological IgE-mediated hypersensitivity, infection, and irritant reaction to spores or mycotoxic metabolites . Mycotoxins can cause acute and chronic respiratory diseases after inhalation of organic dust containing toxigenic molds and mycotoxins, respectively. Molds have been implicated in the induction of asthma and allergic rhinitis through IgE-mediated mechanisms, to cause hypersensitivity pneumonitis through other immune mechanisms, and to cause life-threatening primary and secondary infections in immunocompromised patients . There is a continuous debate as to the causal association of environmental exposure health effects of toxigenic molds and mycotoxins. Stachybotrys chartarum for example, is blamed for a diverse array of toxic effects on exposed individuals. Some studies  argue that despite toxigenic molds' well-known ability to produce mycotoxins under appropriate growth conditions, years of intensive study have failed to establish exposure to S. chartarum in home, school, or office environments as a cause of adverse human health effects. They argue that the levels of exposure in the indoor environment, dose-response data in animals, and dose-rate considerations suggest that delivery by the inhalation route of a toxic dose of mycotoxins in the indoor environment is highly unlikely at best, even for the hypothetically most vulnerable subpopulations. It is further claimed that except for persons with severely impaired immune systems, indoor mold is not a source of fungal infections . These arguments are unfortunately subjective and have since been disabused by significant volumes of evidence and the emergence of modern technological developments, including nanotoxicology. It is becoming much clearer that the emergence of this new scientific developments will provide sufficient evidence in support of adverse effects of chronic inhalation of mycotoxins in home, school, or office environments. Already, there is general agreement that active mold growth in indoor environments is unsanitary . It must be emphasized that “sanitary” is a function of contamination and a platform for infection. Several pieces of evidence are also found of a relationship between high levels of inhalation exposure or direct contact to mycotoxin-containing molds or mycotoxins, and demonstrable effects in animals and humans [8,10,11,17]. Volumes of evidence in peer-reviewed literature believe and support the fact that the induction of cancer by a majority of mycotoxins is a major public health concern especially, at chronic levels of exposure . The most documented and important mycotoxins in this regard, are aflatoxins, ochratoxin A, fumonisins, trichothecenes, and zearalenone. Aflatoxins are potent carcinogens, which in association with hepatitis B virus, are claimed to be responsible for many thousands of human deaths per annum, mostly in non-industrialized tropical countries. Ochratoxin A is a probable carcinogen, and may cause urinary tract cancer and kidney damage in people from northern and eastern Europe. Fumonisins appear to be the cause of oesophageal cancer in southern Africa, parts of China and elsewhere. Trichothecenes are highly immunosuppressive and zearalenone causes estrogenic effects in animals and man . Chronic indoor environmental exposure to toxigenic molds leads to various adverse neuroimmunologic and behavioral consequences to which allergy, asthma, hypersensitivity, pneumonitis, and mucus membrane irritation are manifested [19,20]. Abnormalities in T and B cells, and subsets, were found in more than 80% of the patients . Vojdani et al. investigated the antibodies against seven different molds antigens and two mycotoxins using enzyme-linked immunosorbent assay (ELISA) in the blood of 40 controls and 40 mold-exposed patients. They found abnormal immunoglobulins (IgG, IgM, and IgA antibodies), in mold-exposed patients compared to the control. Most patients with high levels of antibodies against various mold antigens, also exhibited elevated antibodies against purified mycotoxins, indicating that the patients had been exposed to mold spores and mycotoxins. Detection of high levels (colony-forming units per cubic meter) of molds and a significant elevation in IgG, IgM, or IgA antibodies against molds and mycotoxins, strongly suggests a reservoir of spores in the indoor environment of the patients . One of the immune system disorders usually found in patients presenting with toxigenic mold exposure is an abnormal natural killer cell activity. It is possible that mycotoxins exert some effects on the circadian rhythmic processes resulting in sleep deprivation to which an acute and transient increase in NKC activity could be observed . At very low physiological concentrations, mycotoxin-induced abnormal NKC activity could lead to depression, psychological stress, tissue injuries, malignancies, carcinogenesis, chronic fatigue syndrome, and experimental allergic encephalomyelitis. In the light of these observations, it is evident that chronic exposures to toxigenic mold could lead to abnormal NKC activity with a wide range of debilitating neurological consequences . Myconeurotoxicity refers to any adverse effects of exposure to mycotoxins or byproducts of primary and secondary mold metabolism, including volatile organic compounds (VOCs) on the structural or functional integrity of the developing or adult nervous system . Neuromycotoxic effects may involve a spectrum of biochemical, morphological, behavioral, and physiological abnormalities whose onset can vary from immediate to delayed actions, following exposure to a mycotoxins. The duration of effects may be transient, or persistent, and result in disability in some individuals, while some may have life-threatening consequences. Mycotoxins may act directly on the elements of the nervous, or other biological systems, which then induce adverse systemic response. Although, neuromycotoxic disorders can be established using clinical electrophysiological techniques, there is always the possibility of false positive and false negative results in some patients, which may be due to a multi-factorial etiopathogenesis of neuromycotoxicity. However, detection of nervous system toxicity and other measures of toxicity could be achieved using a combination of neurodiagnostic techniques . Mycotic demyelinating optic neuritis is a neurological disorder of the visual system caused by mycotoxins released by indoor toxic molds. The health effect of indoor toxic mold on the population worldwide could be regarded as one of the “emerging diseases”. Most of the neurological and immunologic abnormalities associated with toxic mold mycotoxins are very difficult to treat successfully, especially neural demyelination of the central and peripheral nervous systems . However, Campbell et al. successfully treated some patients with a combination of intravenous immune globulin (IVIG) and itraconozole (Sporanox) when all other treatment modalities failed. Recent studies carried out by Crago et al. on patients (N = 182) with confirmed mold-exposure showed high levels of physical, cognitive, and emotional symptoms. Most of the patients were found to suffer from acute stress, adjustment disorder, or post-traumatic stress. Neuropsychological testing also, revealed predominance of impaired functioning on multiple cognitive tasks. A dose-response relationship between measures of mold exposure and abnormal neuropsychological test results and QEEG measures suggested that toxic mold caused significant problems in exposed individuals . In another objective neuropsychological study of 46 of the patients , the patients exhibited abnormalities in short-term memory, executive function/judgment, concentration, and hand/eye coordination. Other neurobehavioral manifestations in the mold-exposed individuals are abnormal decrease in steady balance, reaction time, blink-reflex latency, color discrimination, visual fields, and grip, compared to control . Hence, most exposed patients have reduced cognitive functioning in multiple domains, with memory and executive functions the most commonly affected areas. [25,26,27,28]. Upper respiratory exposure to different environmental antigens results first in the activation of mucosal immunity and production of IgA antibodies in different secretions including saliva. Vojdani et al. studied the saliva IgA antibody levels against seven different molds in 40 patients exposed to molds and in 40 control subjects. Mold-exposed patients showed significantly higher levels of salivary IgA antibodies against one or more mold species. A majority of patients with high IgA antibodies against molds exhibited elevation in salivary IgA against mycotoxins, as well. These IgA antibodies against molds and mycotoxins are specific, since using molds and mycotoxins in immune absorption could reduce antibody levels, significantly. Detection of high counts of molds in water-damaged buildings, strongly suggests the existence of a reservoir of mold spores in the environment. Whether mold and mycotoxin specific IgA antibodies detected in saliva are indicative of the role of IgA antibodies in the late phase of type-1 hypersensitivity reaction or in type-2 and type-3 delayed sensitivities was not immediately established. Upper respiratory tract, lower respiratory tract, systemic, and neurocognitive symptoms were reported in 80%, 94%, 74%, and 84% of patients, respectively . The clinical presentation of patients with perceived mold-induced toxic effects is characterized by a disparate constellation of symptoms. Toxic mold syndrome represents the furtive evolution of aeroirritation from a transient to permanent symptom complex in patients with a psychogenic predisposition. In this respect, the core symptoms of toxic mold syndrome and their gradual transition to chronic symptoms related to nonspecific environmental fragrances and irritants appear to mimic what has been observed with other pseudodiagnostic categories, such as sick building syndrome and idiopathic chemical intolerance . Anyanwu et al. (2003) analyzed and present the biochemical abnormalities in the sera of patients presenting with chronic mycosis in order to investigate the relationship with the risks of multiple renal disorders. Blood samples from both the patients and the controls and found biochemical abnormal concentrations in creatinine, uric acid, phosphorus, alkaline phosphotase, cholesterol, HDH, SGOT/AST, segmented neutrophils, lymphocytes, total T3, IgG and IgA immunoglobulins with significant differences between patients and controls. These abnormalities were consistent with multiple renal disorders and depictive of a strong association of chronic mycosis with abnormal renal indicators. The overall functions of vitamin B12 as a source of coenzymes, in intracellular recycling of methionine, in methionine synthase reaction, in the prevention of chromosome breakage, in methylation, and in maintaining a one-carbon metabolic balance are well established. Signs, symptoms, and clinical neurological indications of vitamin B12 deficiency are also been known . Consistent vitamin B12 deficiency in chronic toxigenic mold exposures has been observed in patients exposed to chronic toxigenic molds and mycotoxins . It is possible that the synergistic mycotoxic effects on one-carbon metabolism will lead to the manifestations of clinical neuropathological symptomology. Since patients with chronic exposures to toxigenic molds manifest vitamin B12 deficiencies, the role of mycotoxins in vitamin B12 metabolism is recognized. Since vitamin B12 plays important biochemical roles in one-carbon metabolism, the synergistic effects with mycotoxins on humans are apparently possible. By implication and derivation, it is likely that the interruption of the structure and function of vitamin B12 would in turn interfere with the one-carbon metabolism leading to the neurological manifestations . The validity of the health effects of chronic toxigenic mold and mycotoxin exposures has been reviewed. The exposures to mixed molds and mycotoxins are confirmed to lead to CNS and the immune system, have pulmonary, and allergic effects preceded by inflammatory processes . Subsequently, these events lead to the observed neurobehavioral abnormalities in exposed individuals [21,23]. In the light of recent compelling pieces of evidence available in peer-reviewed literature and the emergence of the science of nanotoxicology, it is almost imperative that most of the controversies concerning the validity of the adverse health effects of chronic environmental toxigenic and mycotoxic exposures can at least in parts, be resolved. Further researches in this area are highly recommended. 1. Hardin BD, Kelman BJ, Saxon A. Adverse human health effects associated with molds in the indoor environment. J Occup Environ Med. 2003 May;45(5):470-8. 2. Anyanwu EC, Mycotoxins and antifungal drug interactions: implications in the treatment of illnesses due to indoor chronic toxigenic mold exposures. ScientificWorldJournal. 2004a Mar 12;4:167-77. 3. Jarvis BB, Miller JD. Mycotoxins as harmful indoor air contaminants. Appl Microbiol Biotechnol. 2005 Jan;66(4):367-72. Epub 2004 Nov 23. 6. Hussein HS, Brasel JM. Toxicity, metabolism, and impact of mycotoxins on humans and animals. Toxicology. 2001 Oct 15;167(2):101-34. 7. Rea WJ, Didriksen N, Simon TR, Pan Y, Fenyves EJ, Griffiths B. 8. Arch Environ Health. 2003 Jul;58(7):399-405. 10. Jarvis BB. Chemistry and toxicology of molds isolated from water-damaged buildings. Adv Exp Med Biol. 2002;504:43-52. 11. Anyanwu E, Campbell AW, Vojdani A, Ehiri JE, Akpan AI. Biochemical changes in the serum of patients with chronic toxigenic mold exposures: a risk factor for multiple renal dysfunctions. ScientificWorldJournal. 2003 Nov 3;3:1058-64. 12. Anyanwu E, Ehiri J, Akpan AI. Application, effectiveness, and limitations of the electrophysiological diagnosis of neurotoxic effects of chronic environmental mycotoxins in humans. Int J Adolesc Med Health. 2004 Apr-Jun;16(2):107-18. 13. Reijula K, Tuomi T. Mycotoxins of aspergilli: exposure and health effects. Front Biosci. 2003 May 1;8:s232-5. 14. Bunger J, Westphal G, Monnich A, Hinnendahl B, Hallier E, Muller M. Cytotoxicity of occupationally and environmentally relevant mycotoxins. 15. Rylander R, Etzel R. Introduction and summary: workshop on children's health and indoor mold exposure. Environ Health Perspect. 1999 Jun;107 Suppl 3:465-8. 16. Portnoy JM, Kwak K, Dowling P, VanOsdol T, Barnes C. Health effects of indoor fungi. Ann Allergy Asthma Immunol. 2005 Mar;94(3):313-9; quiz 319-22, 390. 17. Edmondson DA, Nordness ME, Zacharisen MC, Kurup VP, Fink JN. Allergy and "toxic mold syndrome". Ann Allergy Asthma Immunol. 2005 Feb;94(2):234-9. 19. Pitt JI. Toxigenic fungi and mycotoxins. Br Med Bull. 2000;56(1):184-92. 20. Vojdani A, Campbell AW, Kashanian A, Vojdani E. Antibodies against molds and mycotoxins following exposure to toxigenic fungi in a water-damaged building. Arch Environ Health. 2003 Jun;58(6):324-36. 21. Kilburn KH. Indoor mold exposure associated with neurobehavioral and pulmonary impairment: a preliminary report. Arch Environ Health. 2003 Jul;58(7):390-8. 22. Anyanwu E, Campbell AW, Jones J, Ehiri JE, Akpan AI. The neurological significance of abnormal natural killer cell activity in chronic toxigenic mold exposures. ScientificWorldJournal. 2003 Nov 13;3:1128-37. 23. Gray MR, Thrasher JD, Crago R, Madison RA, Arnold L, Campbell AW, Vojdani A. Mixed mold mycotoxicosis: immunological changes in humans following exposure in water-damaged buildings. Arch Environ Health. 2003 Jul;58(7):410-20. 24. Campbell AW, Anyanwu EC, Vojdani A. Combination of high-dose intravenous immunoglobulins and itraconozole in treating chronic mycotic demyelinating optic neuritis. ScientificWorldJournal. 2003 Aug 2;3:640-6. 25. Crago BR, Gray MR, Nelson LA, Davis M, Arnold L, Thrasher JD. Psychological, neuropsychological, and electrocortical effects of mixed mold exposure. Arch Environ Health. 2003 Aug;58(8):452-63. 26. Vojdani A, Thrasher JD, Madison RA, Gray MR, Heuser G, Campbell AW. Antibodies to molds and satratoxin in individuals exposed in water-damaged buildings. Arch Environ Health. 2003 Jul;58(7):421-32. 27. Campbell AW, Thrasher JD, Madison RA, Vojdani A, Gray MR, Johnson A. Neural autoantibodies and neurophysiologic abnormalities in patients exposed to molds in water-damaged buildings. Arch Environ Health. 2003 Aug; 58(8): 464-74. 28. Gordon WA, Cantor JB, Johanning E, Charatz HJ, Ashman TA, Breeze JL, Haddad L, Abramowitz S. Cognitive impairment associated with toxigenic fungal exposure: a replication and extension of previous findings. Appl Neuropsychol. 2004;11(2):65-74. 29. Anyanwu EC, Morad M, Campbell AW. Metabolism of mycotoxins, intracellular functions of vitamin B12, and neurological manifestations in patients with chronic toxigenic mold exposures. A review. ScientificWorldJournal. 2004 Aug 26;4:736-45. 30. Vojdani A, Kashanian A, Vojdani E, Campbell AW. Saliva secretory IgA antibodies against molds and mycotoxins in patients exposed to toxigenic fungi. : Immunopharmacol Immunotoxicol. 2003 Nov;25(4):595-614. 31. Khalili B, Montanaro MT, Bardana EJ Jr. Inhalational mold toxicity: fact or fiction? A clinical review of 50 cases. Ann Allergy Asthma Immunol. 2005 Sep;95(3):239-46.